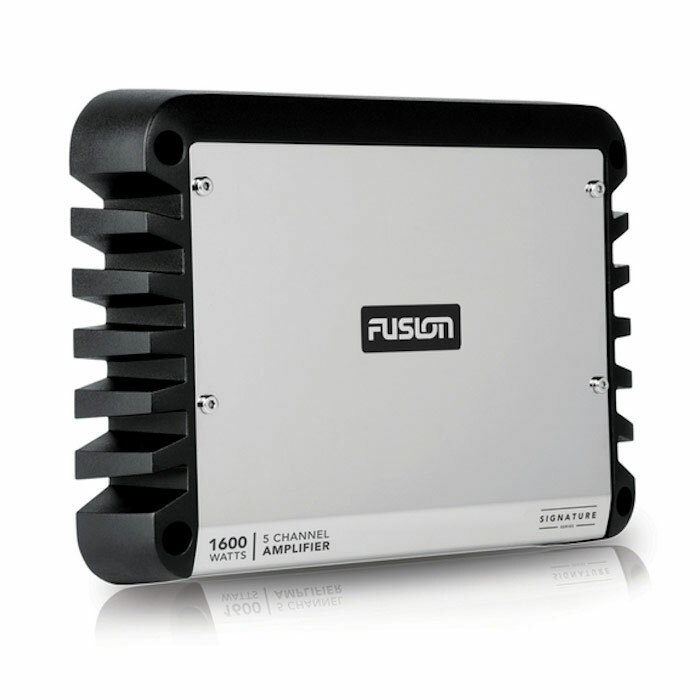 Fusion Signature Series marine amplifiers are purpose-built for the marine environment. Boasting some of the most impressive environmental protection available, they deliver a Signature performance on the water like never before. The SG-DA51600 is Fusion's most efficient and powerful marine amplifier. Its True-Marine design will resist corrosion, and the incredible 1600-watt peak power will drive 4 speakers and 1 subwoofer with ease. The SG-DA51600 is Fusion's first 5 Channel, Class-D Hi-Fi Marine amplifier. The key benefit of a Class-D amplifier is that it has a low battery drain with high output, making this the perfect amplifier for the marine environment. A thin, polymeric film, or conformal coating, conforms to the circuit board to provide protection for maximum product life and performance. Additionally, the amplifier chassis is a heat sink, to reduce component core temperature and increase efficiency. Undeniably a stand-out piece, the stunning stainless steel mirror install panel provides practical confinement of all cable connections and tuning controls, with great looks to complement any vessel. Zone 1 and 2 outputs include 4 speaker channels plus a subwoofer. RCA line-level inputs allow for easy connection to new or existing systems. This product is rated True-Marine and carries with a 3-year limited consumer warranty. Mount: Flush, Cutout: 8-3/4", Mounting Depth: 5-1/4"